You know that expression “The cobbler’s children have no shoes”? Right. That’s my house for the most part, because I’m renovating other people’s homes and don’t take the time to work on my own. 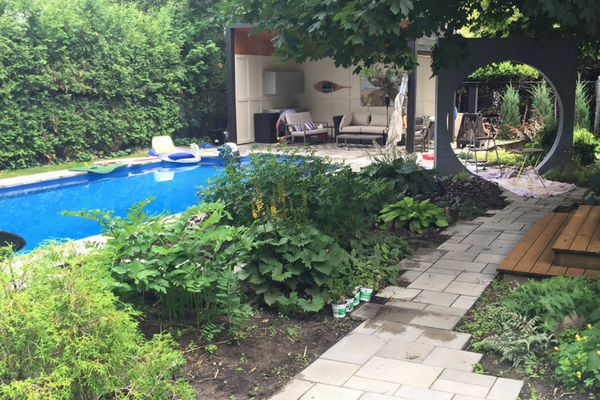 This spring Heather and I decided to tackle the backyard in a big way—adding an in-ground pool, pool house, paths and 700 sq feet of garden. 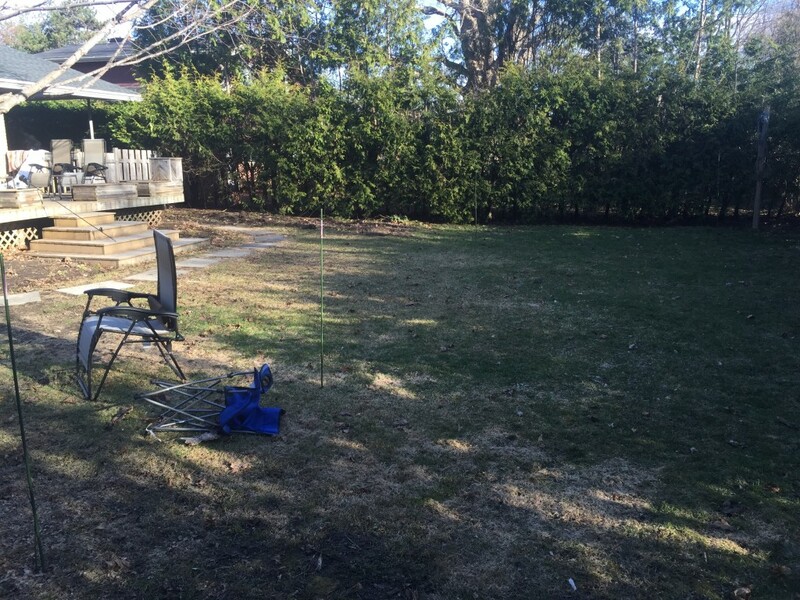 The backyard before. 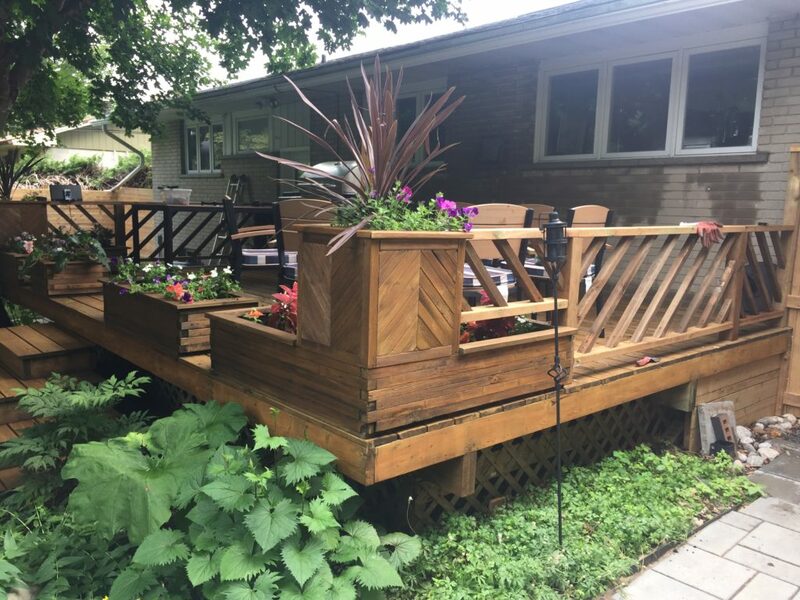 A deck, then (weedy) grass and more grass, and overgrown cedars. 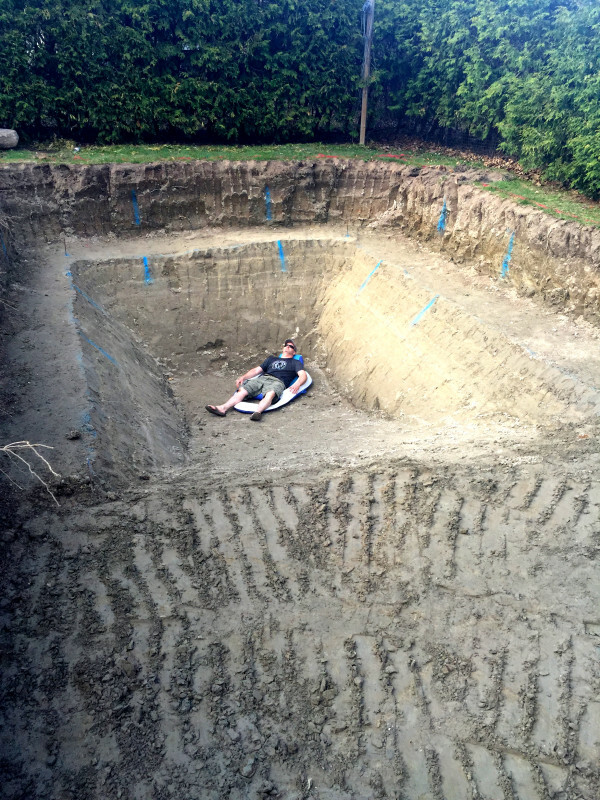 It’s not just anybody driving a backhoe who can dig a pool hole. 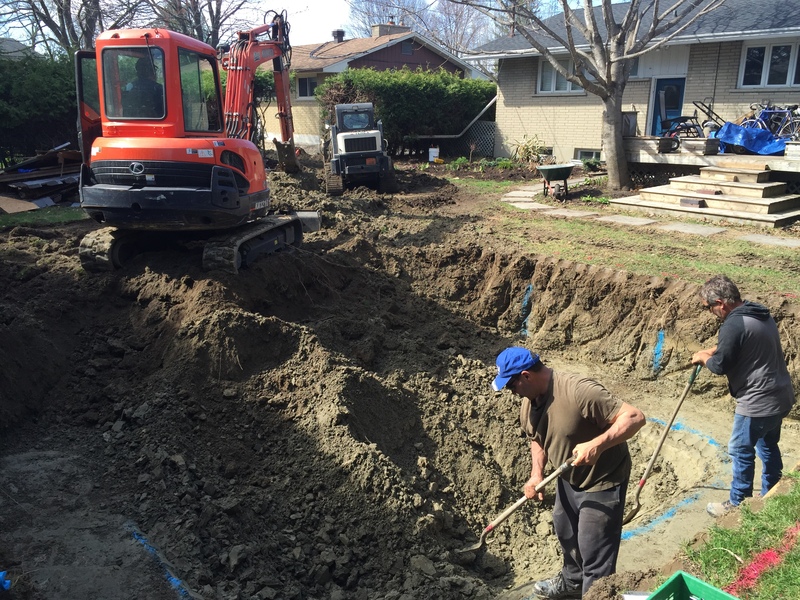 Pool excavators are specialists. After interviewing several, we hired Harvey Harper of Harper Enterprises. He and his team were excellent. Precise to the inch and a pleasure to deal with. I can’t recommend them enough. 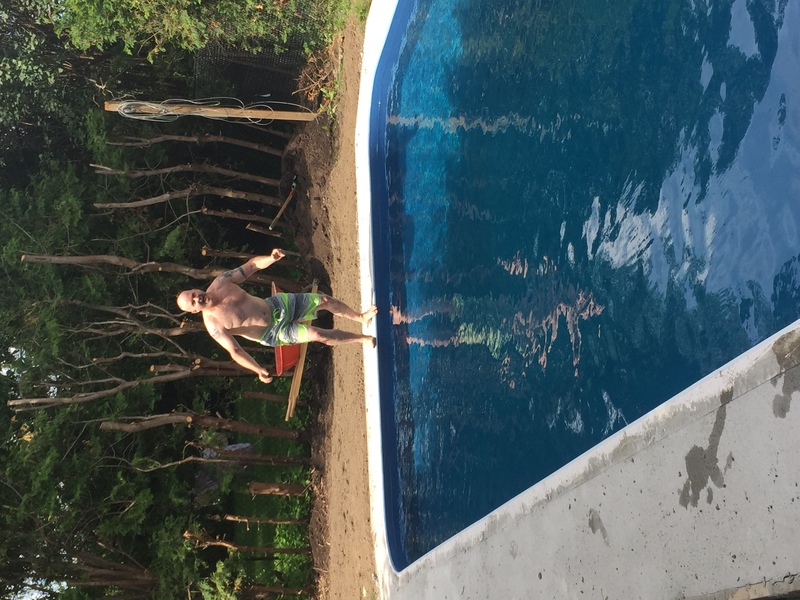 We designed the pool with Mermaid Pools: 14 x 28 with a larger-than-normal shallow end and Roman 8′ Sit and Step for easy socializing. 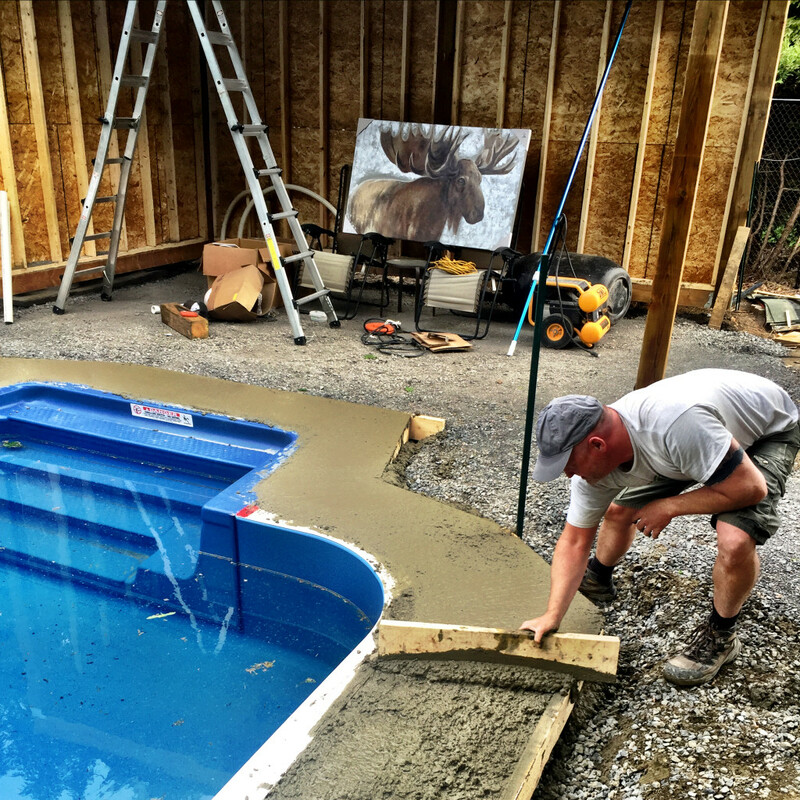 We ordered the pool parts from Mermaid Pools and I’m installing the pool myself—bringing in specialists as needed: for the dig, grouting (concrete base), installing the liner and the electrical. 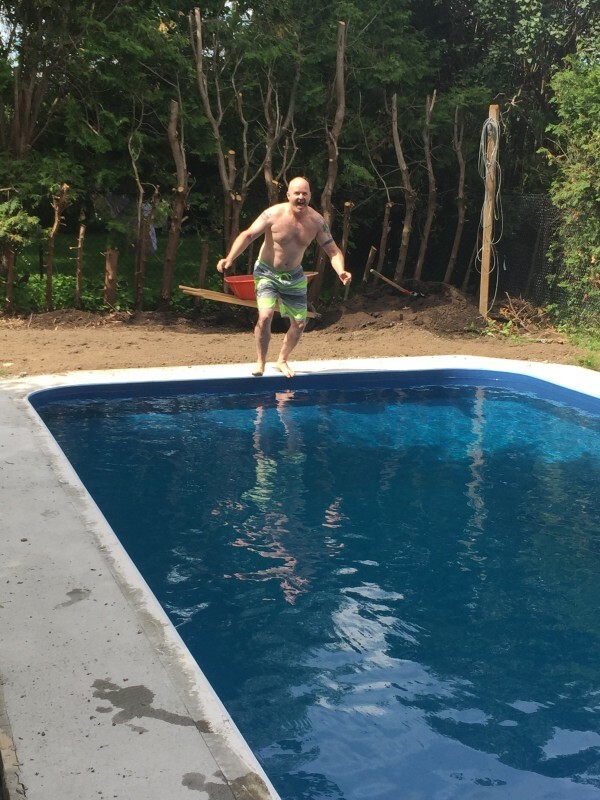 I have zero ambition to start installing pools, but doing it myself at my own house was a considerable cost saving. 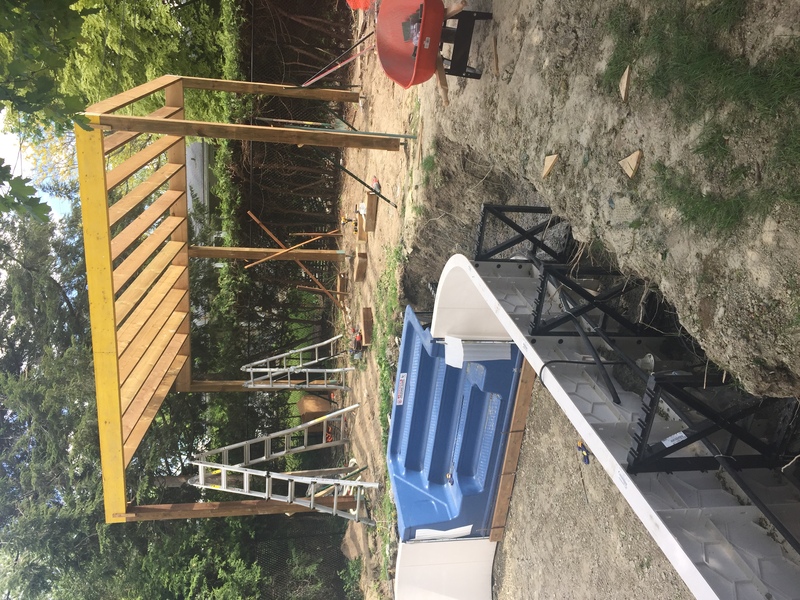 Pool walls installed, safety fence going up. 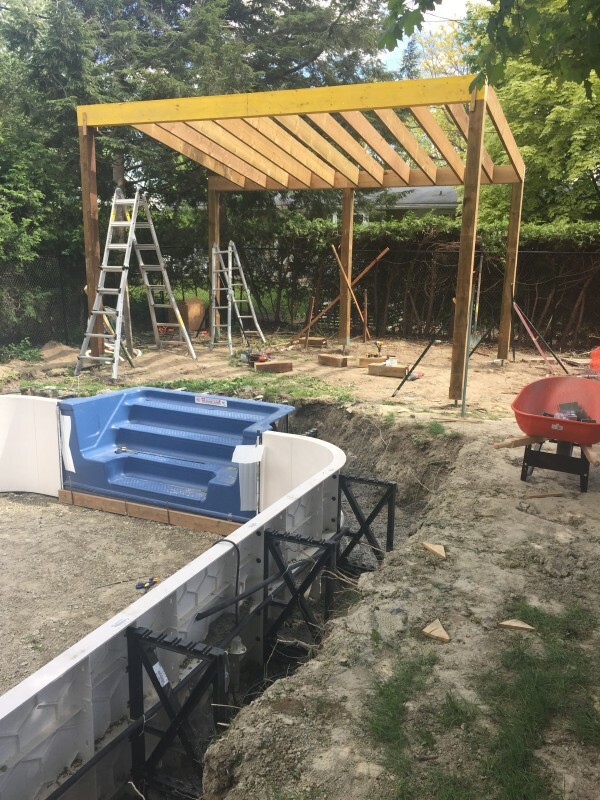 Pool house structure: 16 x 9. 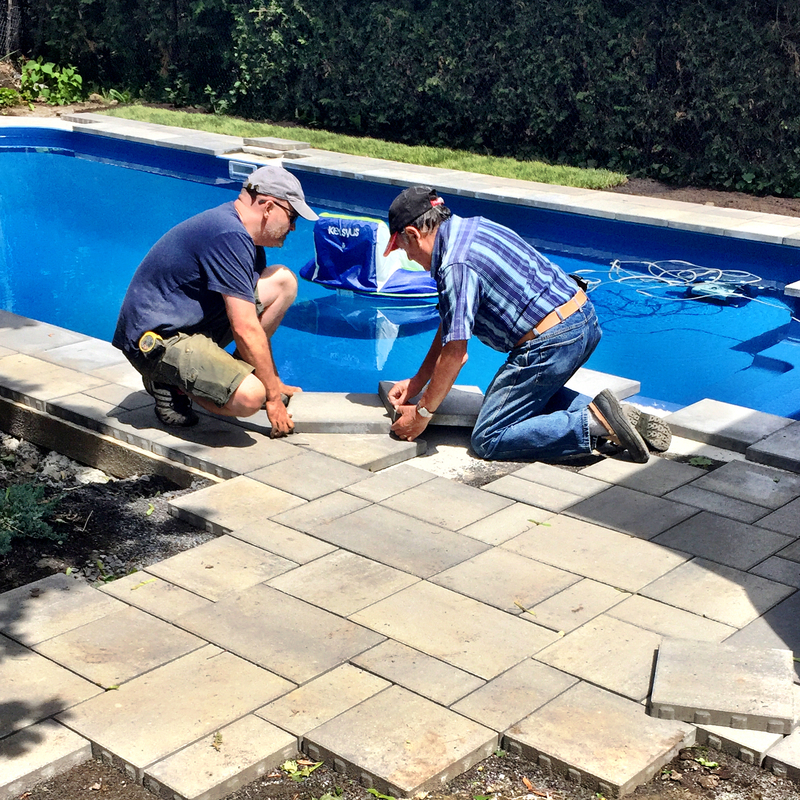 Mark and Joe, pool specialists, “grouting” the bottom of the pool. 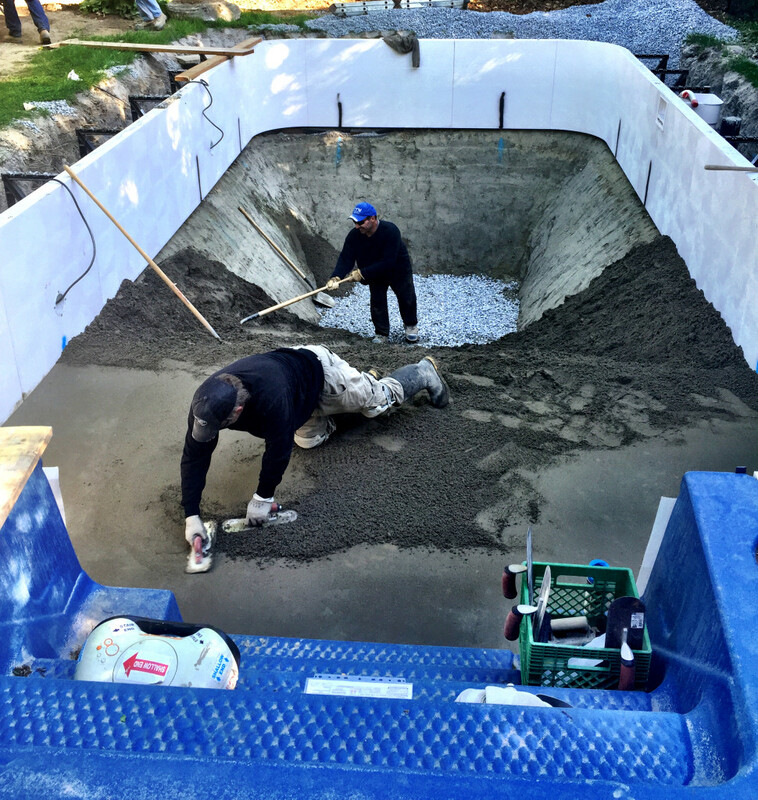 This makes a smooth base for the pool liner. When a liner costs $6,000, you need a perfect base that won’t cause any rips. 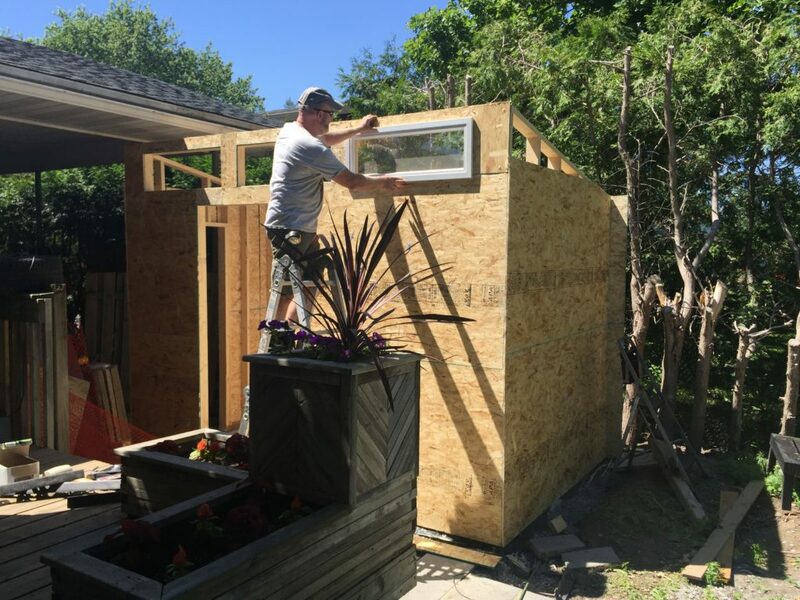 The pool house has walls on two sides (where there are neighbours) and is open to the pool and yard on the other two sides. It will have electrical outlets plus lights, a fridge and a fan. We’ve also ordered composite wood cabinets that are rated for Canadian garage use. Big day!! There is gravel part-way up the pool wall. 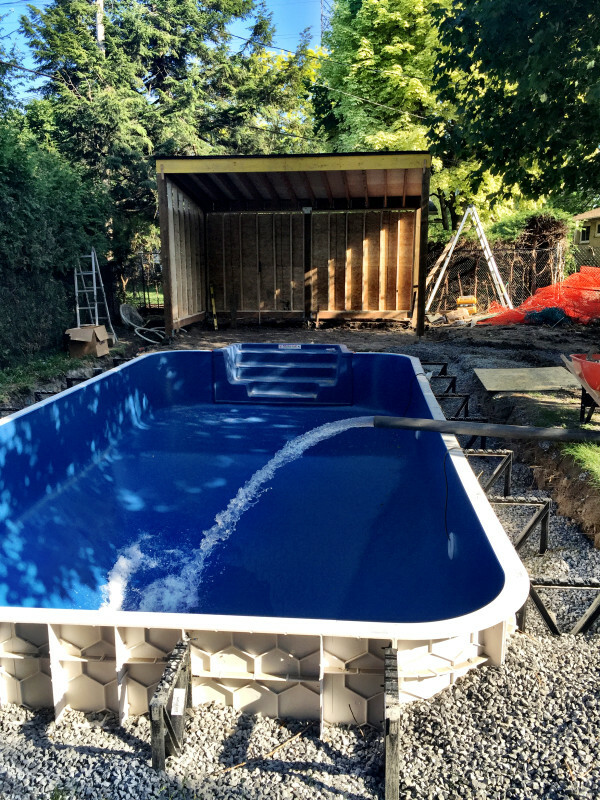 The pool is filled, then the rest of the gravel goes in. We’re getting there! This concrete secures the wall and support system together. 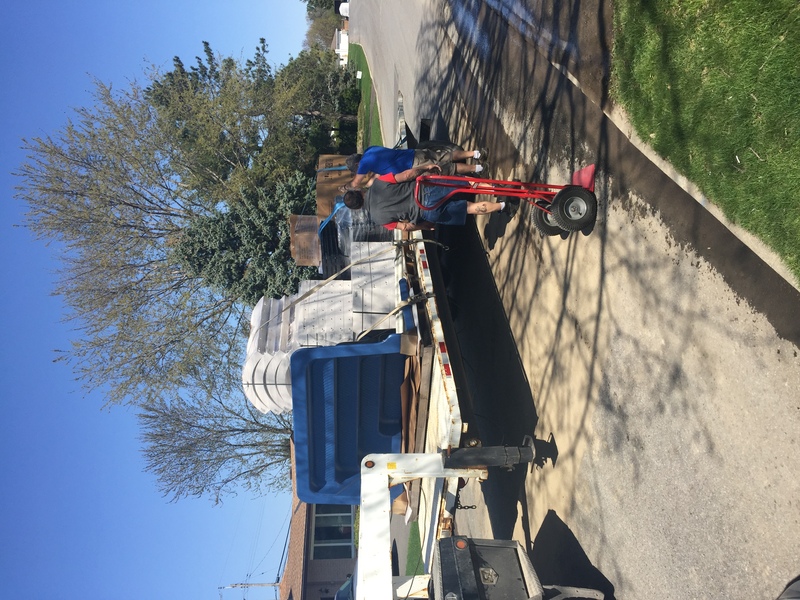 Luc from Centennial Concrete delivered load after load of concrete throughout this project. Great company and driver to work with. The concrete is mixed as it comes off the truck, so you only pay for what you use. We’re getting there! 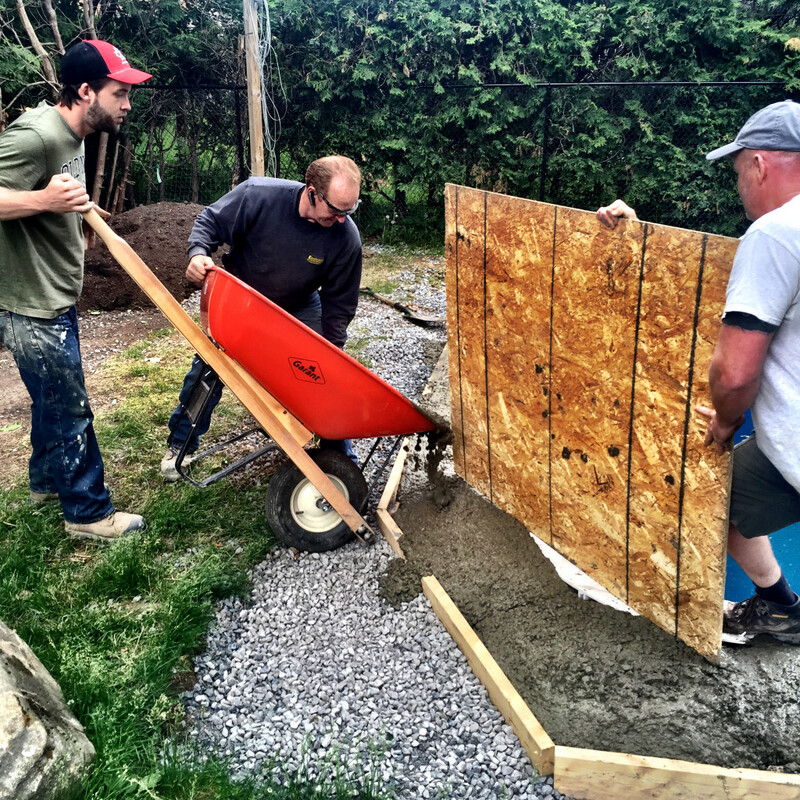 This concrete secures the wall and support system together, and provides a base for the stone around the pool. 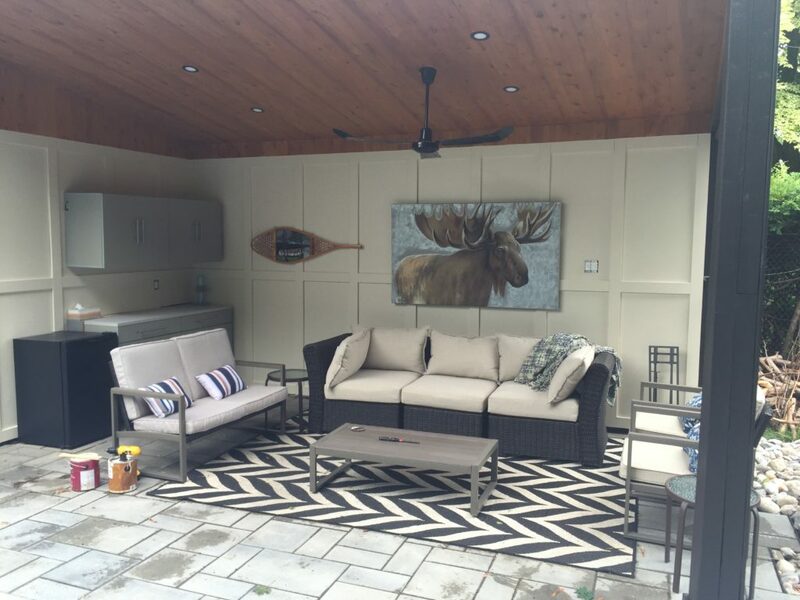 And yes, Mr. Moose in the background will be hanging in the pool house. Yoda, our 12-year-old rescue dog, had a tough time with the early (and loud) stages of this project. She was seized from an abusive situation when she was 10 and we adopted her a few months later. She tends to be anxious to begin with. Big machines digging and making deliveries, changes to her space (it is her bathroom after all), and strangers coming to the house were all hard on her. We finally had a quiet day in the backyard, which seemed to help her adjust. Nothing like a good nap to make things right again. Yoda, 12 years old, taking in the new backyard. First time in the pool. Just 72 degrees F.
See that garden below in the background? That’s the temporary bed. 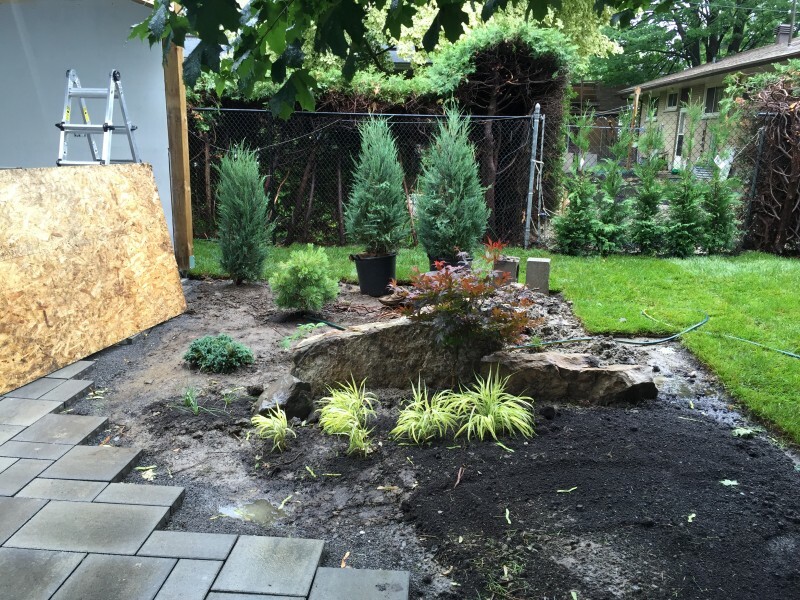 Heather moved two yards of fresh soil and all of the backyard plants in the early spring to protect them during the renovation. This was the only spot that would not be trampled by machines and wheelbarrows. 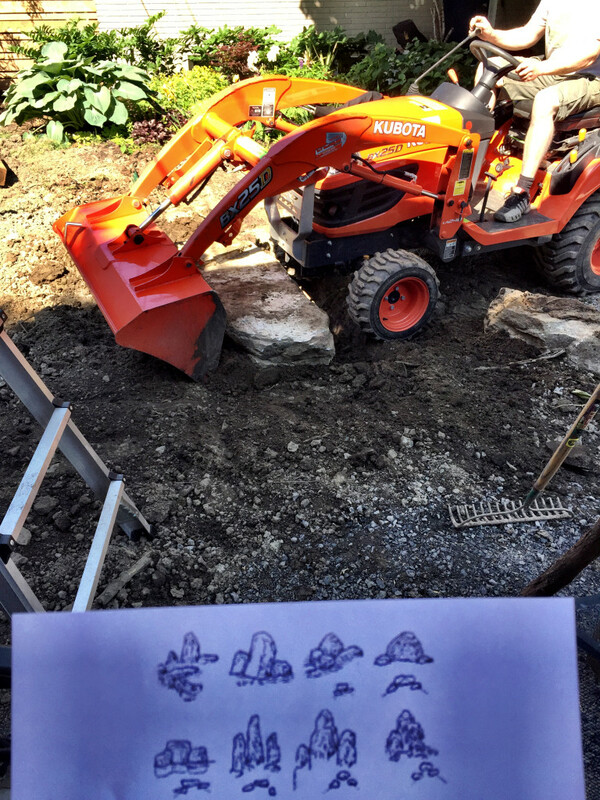 Placing boulders throughout the new gardens around the pool. Our recently retired stone mason neighbour is winning an international award for his work on the new Wabano Centre for Aboriginal Health. 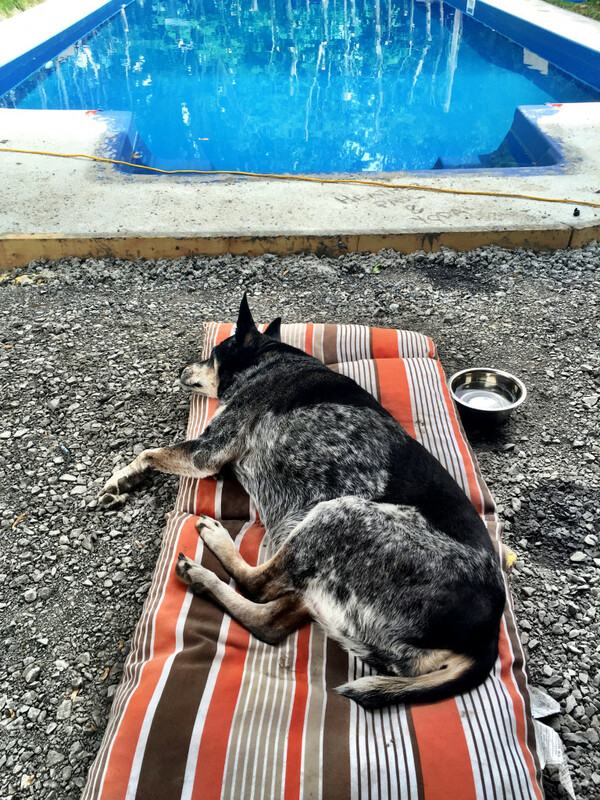 We are beyond grateful that he so generously helped with the final tricky cuts around the pool. The awesome neighbours are just one of the many reasons we plan to live here forever (pool and big garden are no-nos for house re-sale). The neighbours are friendly and kind people. The stone is Blu 45 from Techo-Bloc. 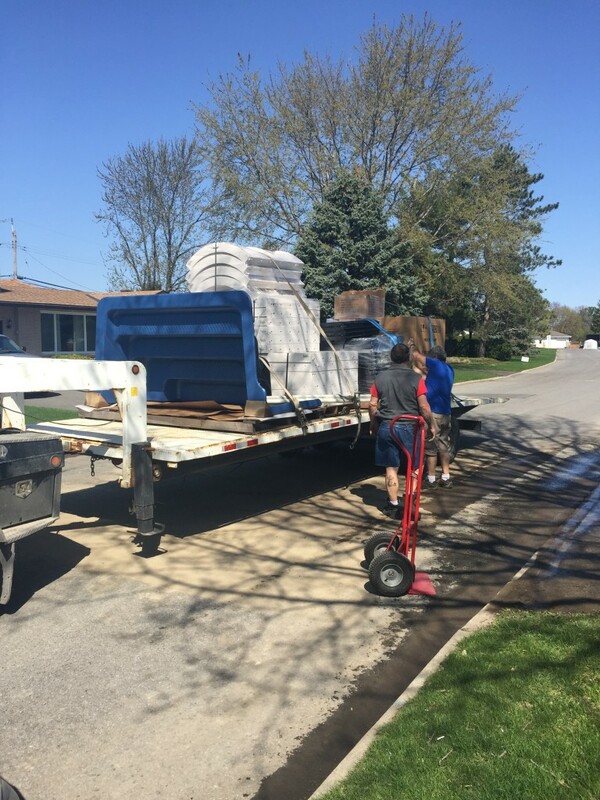 We ordered the stone through Central Precast, which was endlessly frustrating—from Central Precast losing our order, to finding our order, to sending the wrong order, and more. Enough about that. Final tricky cuts around the pool. 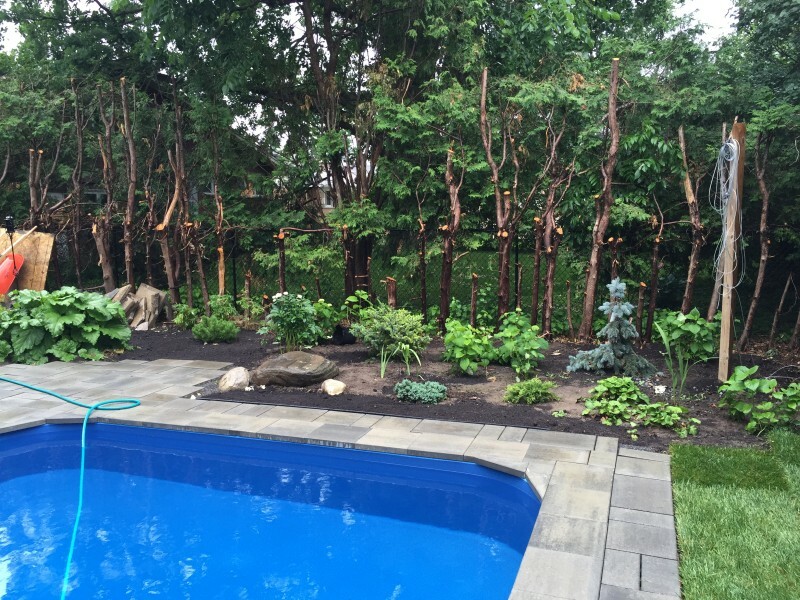 We put in 700 square feet of new garden beds and wanted year-round interest, so chose several evergreen trees and shrubs. The staff at the Green Thumb Garden Centre at 17 Tristan Crt (near Hunt Club and Merivale) are fantastic. Mary, the owner, and some of her staff are Master Gardeners (yes, that’s a thing) and are extremely knowledgeable. 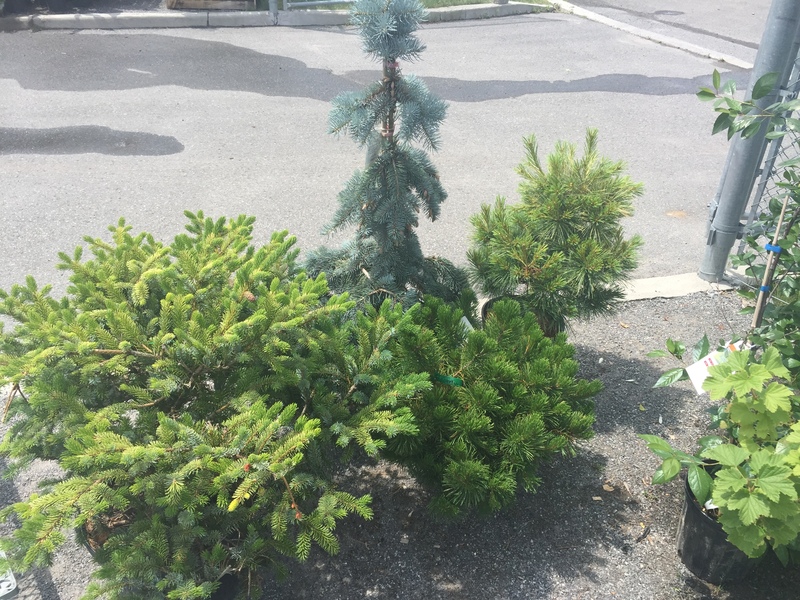 Trees and shrubs from Green Thumb Garden Centre at 17 Tristan Crt, near Merivale and Hunt Club. The cedars along the properly line were badly overgrown after years of neglect by previous home owners. The cedars were six feet deep from the trunk, so they got a serious haircut. We understand that the cedars will never grow back on our side, but it was well worth it to reclaim six feet of yard for the garden. Thanks to a mature maple overhead, this garden next to the pool house gets morning sun at the front and full sun at the back. The maple also provides ample shade to the pool. 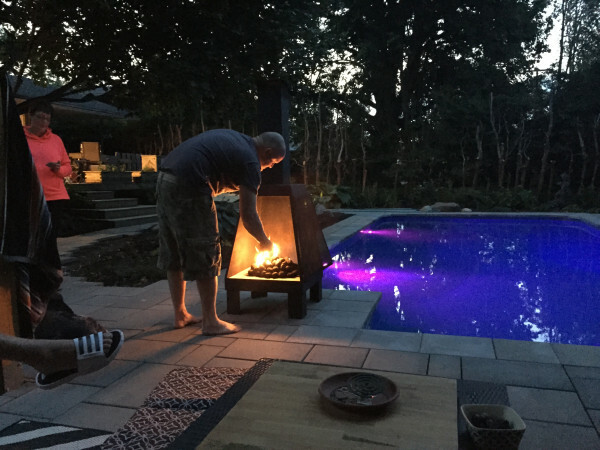 Because every backyard needs a cooking fire. That was my progress in 2015. 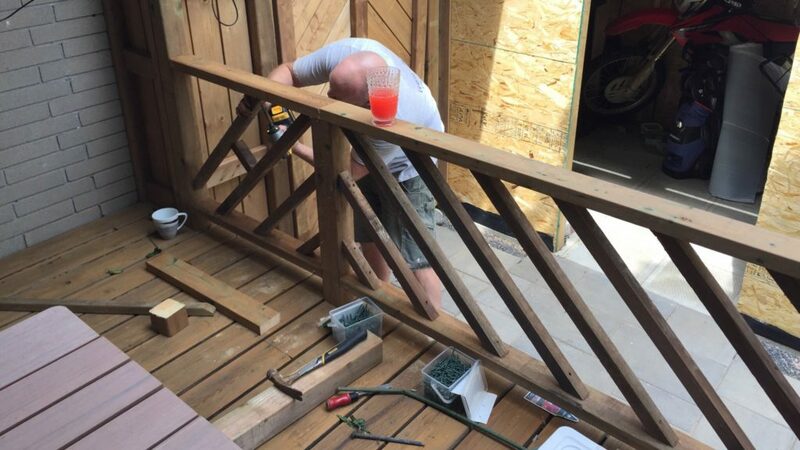 In 2016 the work started anew with the plans including a shed, deck railing, and painting and staining everything. I repurposed the previous deck railing into a new chevron railing. The chevron railing works well with the chevron planter boxes I built a few years ago. Both the railing and the boxes repurposed the wood from the previous railing. 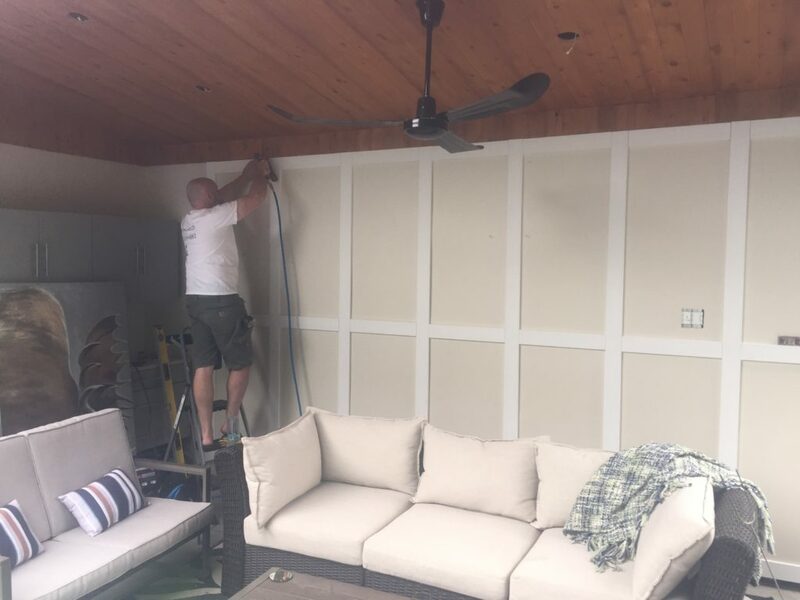 The pool house has electricity, allowing us to have potlights, a fan and a fridge. We weren’t entirely sure about Mr. Moose at first, but he fits in quite well! 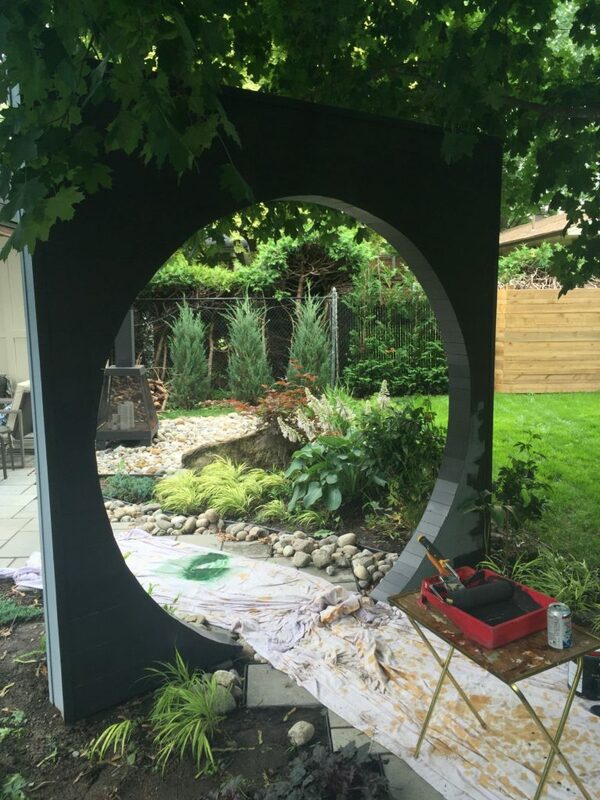 The moon gate marks the transition to the pool area. It helps to create separate rooms. It was primed grey and painted black. 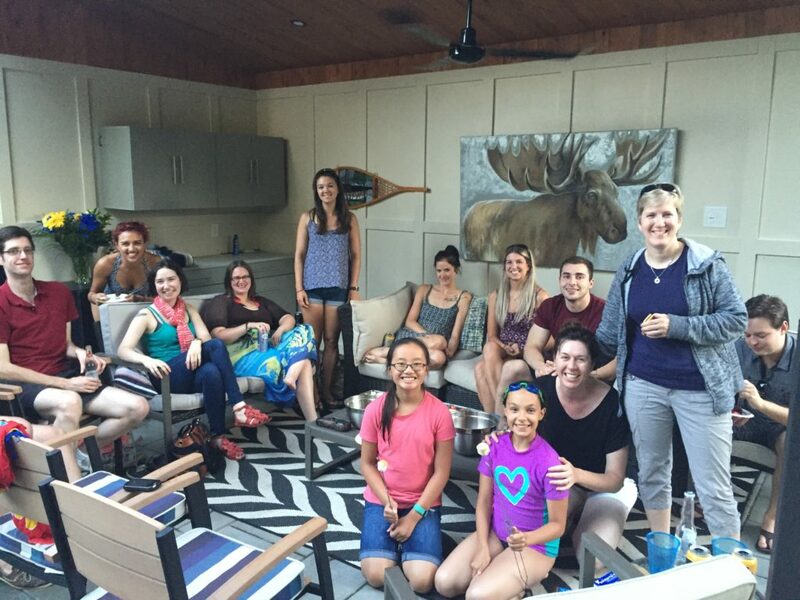 Our first pool party was a volunteer appreciation event for a fantastic folks with Community Veterinary Outreach. They provide a free vet check-up for the pets of Ottawa’s marginalized residents.